The Valley Retreat is in the heart of Hidden Valley and Peninsula Lake. Enjoy all seasons in a newly renovated 3 bedroom, 2000 square foot house. This is our second vacation property in Hidden Valley, the other being The Triple Round and only 500 yards from each other. Although we have just opened this I can assure you it is of the highest quality. Check out our reviews form The Triple Round House with our 5 star rating. The Valley Retreat is steps away from Hidden Valley Ski resort, put your ski boots on and throw your skis over your shoulder and take the few steps to the hill and ski down to get your lift ticket. In the summer we are a minutes drive away to a private beach that is exclusive to residence of Hidden Valley. The private beach is wonderful for all, shallow entry for the small ones, equipped with a play center, large grounds for games, volley ball net, Bbq and raft. Bring your towel and sun screen and cool off. 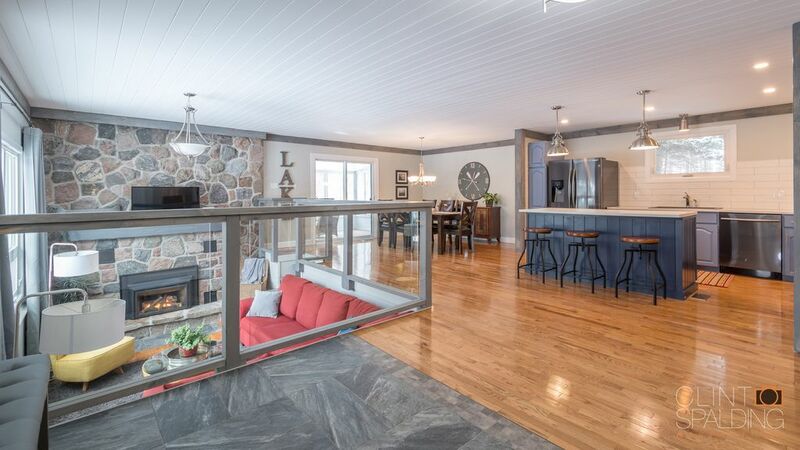 The house has a large open concept living dinning area, sunken living room has a large stone propane fireplace to warm up with after a day of skiing. While the adults are upstairs the kids can enjoy the rec room. Both living spaces are equipt with smart tv's with netflixs. The upstairs has 3 large bedrooms. Master bedroom has a King bed and a sizable newly renovated master bath, double sinks and large walk in shower. Second bedroom has a queen bed and the third has two double beds. Second bath has a tub shower combo. Both baths have heated floors for those chilly mornings. We are only 8 minutes away from the Historical downtown Huntsville. Take a stroll up and down our main street, there is something for everyone. Restaurants, ice cream, clothes or gift shopping. Canoe, kayak, or bike rentals at Algonquin outfitters. If you are after some live shows there is the Algonquin Theater. Around the corner is both Hidden Valley and Deerhurst Resort for those nights you don't feel like cooking. World class golf, Mark O'Meara Grand View, Deerhurst Highlands Deerhurst Resort are only a couple minutes away for the avid golfer. Parks near by are Arrowhead Provincial Park, only 13 min drive offering a mile long outdoor skating rink, hiking trails that lead you to a beautiful water falls tubing and the world famous Algonquin Provincial Park that is only 26 min to the west gate. Both are popular for year round activities, hiking, cross country skiing, fishing, canoeing, snowshoeing, nature watching and much more. If you are looking to be active or just relax Huntsville Muskoka has it all no matter the season. Your home away from home awaits you to enjoy. Just a bit about us, my husband Ross was born and raised in Huntsville, me, I was born in Georgetown and raised here. We live here in Huntsville. My husband is the Roads Forman for the town of Huntsville, and I am a stay at home mom and his support team. Together we have three children, he has two beautiful girls, and I have my handsome son. We chose this property because of its location, we love this area so much. It has something for every season. Ski Hill just steps away, access to a communal private beach, 2 Provincial parks, and just the beauty of Muskoka that never ends. We loved this area so much we have two vacation homes 500 yards from each other. Enough toilet paper and paper towels to get you started. Living room and Rec room are equipt with smart tv's with Netflix, and comfy sectionals. All appliances are brand new and of top quality. Fridge comes with water and ice dispenser. We have both drip, no need for coffee filters there is a permanent filter, and Keurig. All dishes and utensils, and cooking utensils, can opener, cork screw, spatulas and top quality pots and pans, Please no metal in the pots they will scratch and shorten the life of them. Rentals at Huntsville Marina, you need a boaters licence. Google for prices. Screened in porch with windows for cooler nights. Wicker furniture provided. Please do not take out side. A company called Up North runs there business out of Hidden Valley Resorts waterfront, just down the hill. They have jet ski rentals, boat tours, and the latest trend, water jet pack lessons. Steps away to Hidden Valley Ski Hill. Dont have your own equipment they rent it all. 2 world class golf courses are minutes away. Public pool at The Summit Centre in Huntsville. Very cozy and clean place in a great location. Watched deer in the backyard while we ate breakfast. We loved our stay. The house was cozy, clean, and well appointed. Check in/out was straight forward. The hosts were attentive and accommodating. We look forward to our next visit! From the moment we walked in to this beautiful home, we knew we were going to have a great family vacation. Besides for enjoying many of the wonderful winter activities nearby, the most memorable part of our trip were the evenings spent indoors with the family. From the meals cooked in the well equipped kitchen, to the games played in the basement, and the movie nights with the kids by the fireplace. We had a wonderful time, and look forward to returning in the near future. We had a great time and even though the weather wasn’t the best, we were so thankful for such a cozy place to call home for the few days. We appreciated all the little touches the hosts put in - from kids’ toys to cozy blankets. It was a great weekend! Sparking clean and conveniently located to ski hill and snowmobile trails! Ross and Denise were great hosts. Very responsive and accommodating. The home is well appointed and has all the comforts of home. Linens and towels were included which was very handy. The heated floors in both bathrooms was greatly appreciated for our winter weekend stay. Would highly recommend. We are so happy you enjoyed your stay. We are also giving you five stars, the place was left in amazing shape. Such a joy to walk in and see our home has been so well respected. We hope you will be staying with us soon, maybe a summer trip. very clean and beds were comfortable. all supplies that we needed were there. we were out of hydro for a while one morning and the owners even offered to bring us coffee and donuts- very friendly. Ross and I appreciate your effort in getting this review posted. Every review let's us know we are providing a great experience for our guests. Downhill skiing steps away. Private beach 1 minute away, Tree top tracking just off hwy 60. Horseback riding and the lake front Splash Zone at Deerhurst Resort. Canoe and kayak rentals at Algonquin Outfitters in town. Two provincial parks, Arrowhead Provincial Park and World famous Algonquin Provincial Park.